The ABC Carpet will brighten your classroom! The correlation between classroom ambiance and student attention span has been well documented. Dark, dull classroom decors lull students to sleep, while brightly decorated walls and floors add a little energy to the school day. The ABC Carpet takes care of the floor part of your ambiance equation. Each letter of the alphabet forms the border around this multi-colored rug. 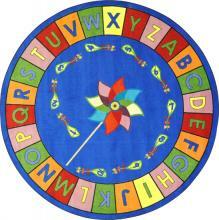 Numbers from one to ten form a pinwheel in the middle of the soft sitting surface. 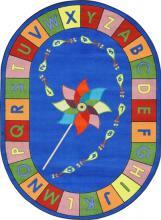 Your students will learn the alphabet and numbers in a fun and interactive way. We have designed our rugs for years to provide supreme comfort for your students. Made with SoftFlex®, the ABC Carpet protects your students from extremely hot or cold floors, while maintaining a wrinkle free appearance. SoftFlex® is an air-texturized, polypropylene, secondary back that is the latest advancement in area rug backing systems. Our material only requires a quick wipe with a damp towel to remove stains. Maintenance only involves occasional vacuuming. 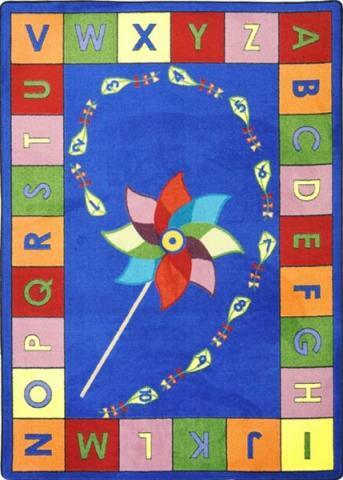 Choose from eight sizes to meet your classroom needs.